Halcyon Way, over the last several, has been slowly and steadily making a name for themselves, from their home town of Atlanta across the US and Canada and then onto the UK and Europe. Most of this was done by touring with other successful headline bands including UDO, Fates Warning, and Fozzy among others. They've garnered many new fans to their interesting hybrid of metal genres. Now they're back with their fourth album, Conquer. Halcyon Way: back in black. If there was any band that could be called a hybrid of metal schemes, it's Halcyon Way. While that hardly makes them novel, other bands do it, it does make them interesting. 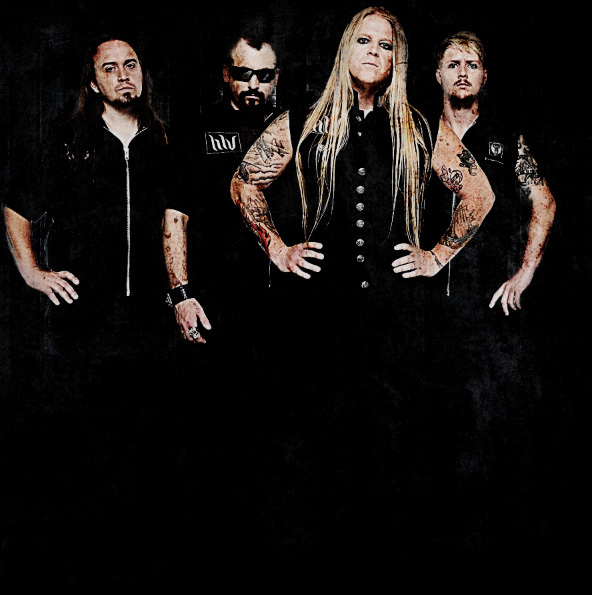 Reaching into their bag of tricks, HW pulls melodic, thrash, power, and death metal to mold their music. Much of this is comes in contrasts. The crushing strength of thrash metal and speed of power metal work along side inherent, even infectious, sense of melody. This comes in the basic arrangements, Steve Braun's vocals, and the damn catchy refrains of many songs. 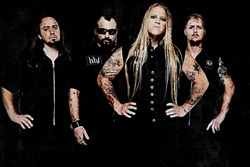 Additionally, Braun's melodic vocals are cast against the death vocals and growls from bassist Sklyer Moore and guitarist Jon Bodan. Actually, the one thing that marks a difference, an escalation as it were, with this recording is Halcyon Way's increased use of death vocals. They're within nearly every song, and I don't get it. Braun is such a powerful voice, one of the best melodic metal vocalist in the field. His addition made Halcyon Way a stronger, better, band. Whether it's for commercial viability or to be trendy and so capture the modern metal crowd, it seems like a step backwards for the band. When I listen to Home, The Poisoned Apple, or especially Save Your Tear, which have no dirty vocals, I'm more amazed and entertained by Halcyon Way's creative amalgamation of metal forms. Alternatively, when these vocals are more nuanced, as within Hatred Is My Cause or Web of Lies, they're more palatable. Regardless of your opinion of death/dirty vocals, Conquer is easily Halcyon Way's most accessible, dare I say, most commercial, feeling album to date. The songs are tight and compact, melodic and catchy, but also inherently heavy metal intense and blistering, with guitarist Jon Bodan tearing up that fret board with more of his deft wizardry. Among their fans, and modern metal fans in general, if this album isn't a huge hit for Halcyon Way, then there's some serious trouble in the Americal metal scene. Recommended. 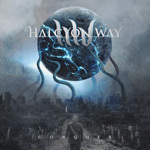 Conquer is easily Halcyon Way's most accessible, dare I say, most commercial, feeling album to date. The songs are tight and compact, melodic and catchy, but also inherently heavy metal intense and blistering, with guitarist Jon Bodan tearing up that fret board with more of his deft wizardry.